Volunteers positively impact our lives everyday. The WDM is extremely proud of the dedicated and hardworking volunteers who contribute to our Museum and our communities. In 2018, 1,077 volunteers donated 46,113.25 hours to the WDM locations in Moose Jaw, North Battleford, Saskatoon, Yorkton, and at the Corporate Office. Volunteers give their time for many reasons – to gain new skills and experience, build confidence, to lend a hand, or to give back and lift up their community. These dedicated individuals have an immeasurable impact on the Museum with their energy, stories and passion for Saskatchewan history. 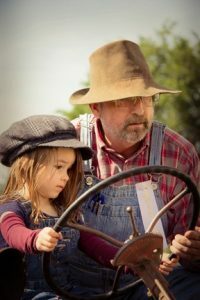 From those directly in the public eye leading engaging gallery tours or delighting kids with real horse and wagon rides, to those who work behind the scenes caring for artifacts, our volunteers bring and share their unique experience and talents. Without them, messages couldn’t be sent by telegraph, our galleries would be a lot quieter, our steam engines wouldn’t operate, and school programs would be a lot less fun. The WDM’s doors are always open to new volunteers. Please contact a WDM near you or visit our volunteer page. April 7 – 13 is National Volunteer Week. Check out some of the things WDM volunteers do to make your visit more enjoyable. 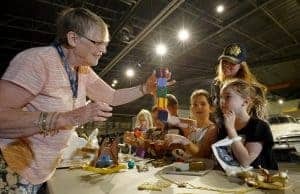 WDM Moose Jaw volunteer Margaret French is helping at a station during Museum Learning Day, where she is assisting with a demonstration of replica wooden toys. Museum Learning Day is a unique opportunity for students from Kindergarten to Grade VI to visit the Museum and be involved with a variety of hands-on activities. 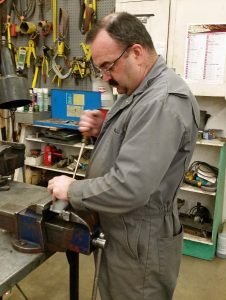 WDM Moose Jaw Senior Steam Program Coordinator and volunteer Don Fox oversees a dedicated crew of volunteers who have put in thousands of hours of work. 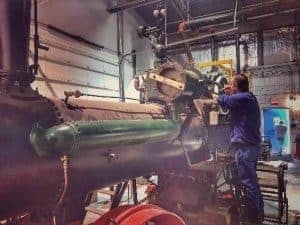 In addition to keeping the Vulcan locomotive operating and maintained, the steam volunteers also work on restoration projects like our 75 Case traction engine. Small packages spring big contributions. Volunteers encourage everyone to give of their time. Ensuring a safe, positive experience will help increase interest, recruit, retain volunteers of all ages. Pictured are Volunteers Dean Deer & Cordelia Bonnycastle at the WDM North Battleford. Although this is not always the “pretty” work, volunteers are essential in the regular maintenance of our equipment and extension collection. The talents of many including WDM North Battleford volunteer Kevin Garner, come together to provide this essential service. 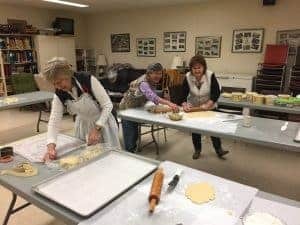 The Women’s Auxiliary to the WDM Saskatoon spend hours baking 2.000 home-made cookies for the Grade 3 Christmas program. 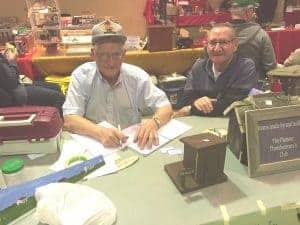 Throughout the year, members of the Pioneer Threshermen’s Club work of wood-working projects that are sold at their flea markets in April and October, as well as at other Museum events at the WDM Saskatoon. Since 1955 the Yorkton Threshermen’s Club has partnered with WDM Yorkton and 2019 marks the 64th year of Threshermen’s Show and Seniors’ Festival. 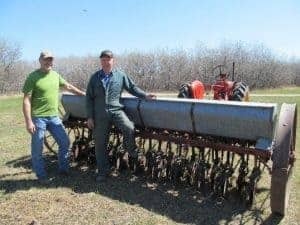 Yorkton Threshermen’s Club members Brian and Louis seed the back field in preparation for the Festival in 2018. 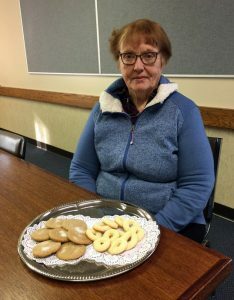 WDM Yorkton volunteer Sandra made four dozen cookies for visitors at a recent event. Pictured with Sandra are two types of cookies, Danish butter cookies and Swedish gingersnaps. 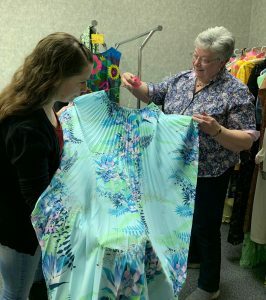 Much of the behind-the-scenes work of the WDM happens at the Corporate Office in Saskatoon, including preparations for our famous fashion shows. Fashion shows are a team effort and volunteers are involved every step of the way. 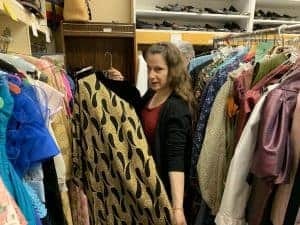 From selecting fabulous pieces from the WDM’s hands-on collection, to writing witty scripts, to pressing, steaming and mending, to packing the items up to ship to one of our WDM locations, the show wouldn’t go on without them. On show day, all of our fashion show models are volunteers. Backstage, more volunteers make sure skirts sit just right, hats aren’t on backwards, and every model who walks the runway looks their best. Come see WDM Fashion Show this summer!